Our Aunt Connie tipped us off to a final item of outdoor gear for the angler about to make that final journey across the river. Glory Boat's Boat casket. "Used in funeral services the same way as traditional caskets Glory Boats are compatible with standard burial vaults. The internal dimensions of a Glory Boat allow even the largest individuals to easily fit. 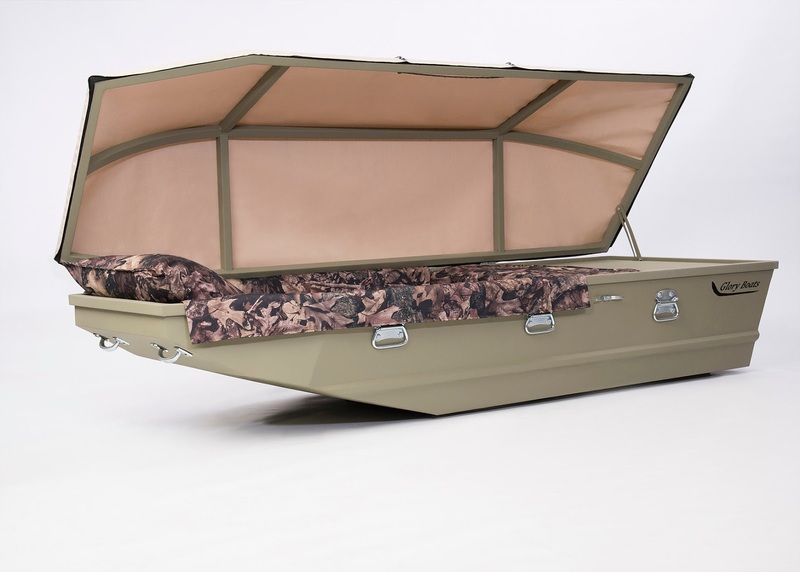 The inside of a Glory Boat is softer and more comfortable than traditional caskets. The outside of a Glory Boat is rugged and tough like many of the outdoors enthusiasts who loved spending time on the water in their lives." No word if they are planning on making a whitewater raft coffin for those who are headed down the rapids, instead of across the river.